St. John’s is an Episcopal Church located in Lockport, Illinois, a congregation in the Episcopal Diocese of Chicago. The Episcopal Church is a mainline Anglican Christian church founded in 1789 and is mainly in the United States (100 dioceses) but also has a presence throughout the world including Honduras, Taiwan, Columbia, Ecuador, Haiti, the Dominican Republic, Venezuela, and the British Virgin Islands and other parts of the world. As Episcopalians, we are part of the 80 million people world-wide who make up the Anglican Communion which grew out of the Church of England. The United States represents one of the 37 provinces of the Anglican communion worldwide. We are committed to encouraging intellectual honesty, and we strive to lead lives dedicated to loving God and our neighbor. In the Episcopal Church, we reflect the diversity and breadth of Christian theological views, worship/liturgical practices and organizational structures (Book of Common Prayer). What we hold in common is our understanding that, however we come to Christ, we pray together and we are called to live out our faith on a daily basis, whether we are at home, school, work or recreation. The cornerstones of our faith are Scripture, Tradition, and Reason. We are not Christians in isolation but are part of a living faith that spans 2000 years. Tradition is the embodiment of our experience as Christians throughout the centuries. The heart of our tradition is expressed through the Bible, the Creeds (statements of faith, written in first centuries of the church’s existence), the Sacraments (Holy Eucharist and Baptism), and the ordained ministry passed on by Christ to his Church. Our tradition is expressed with many voices, among which are a variety of worship styles, languages, cultures, architecture and music. Our tradition encourages this diversity. We seek to value the life and story each person can bring to the community of faith. As in a multi-textured tapestry, each person’s existence is woven into the life of the whole, making it stronger and more beautiful. St. John the Evangelist Episcopal Church is located several blocks east of the Illinois and Michigan Canal is central Illinois. 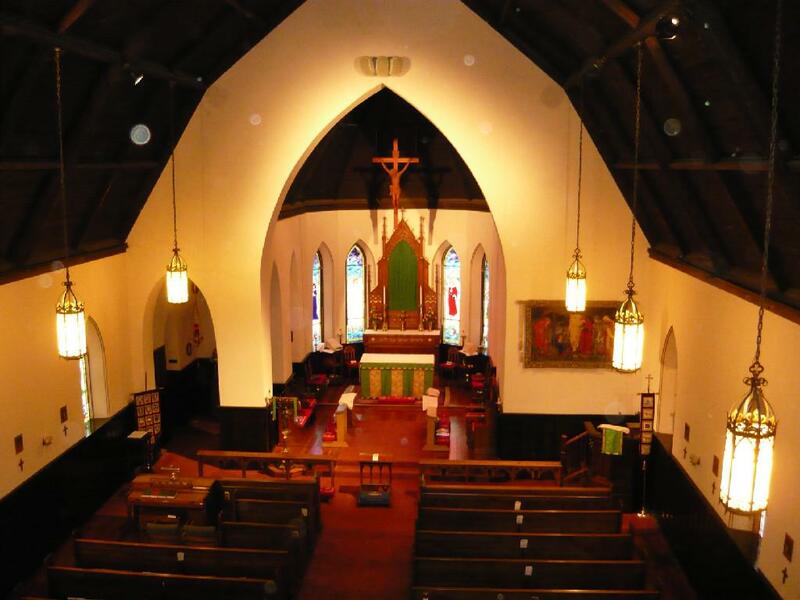 On December 27, 1834, the first religious service in the Lockport region was held by frontier pioneers and the founding members of St. John the Evangelist Episcopal Church. The church was received on June 7, 1841 as a duly organized parish by The Rt. Rev. Philander Chase, first bishop of the then Episcopal Diocese of Illinois. It was in 1844 when our first oak frame church was built. In 1870 the current structure became the congregation’s permanent home. A classic example of English Gothic Revival architecture, it was designed by P. N. Hartwell, a local architect and built using native yellow limestone by Julius Schreibe of Lockport. Fire gutted the church in 1909. Overcoming many challenges the church was rebuilt and was re-dedicated in 1910. During the mid 1980’s, the congregation launched a considerable renovation project. It had included the reclamation of four chancel arches, and a narthex arch which were covered over during the 1910 rebuild. In the late 1990’s a new digital-pipe organ was installed on a balcony attached to the west wall. The reredos (the large wooden structure behind the altar), which had been removed prior to the 1909 fire, was discovered and returned to the church. It was restored to its pre-fire condition and is the only wood article in the building pre-dating the fire. In recent years (1997-2008) the congregation has continued to improve the worship space. The churches stained glass windows have been recreated. The highlights of this renovation include the rose window depicting Creation over the main entrance and the four windows surrounding the altar area. These windows depict the four angels mentioned specifically in the Bible (Ariel, Gabriel, Michael, and Raphael). In addition the stained glass windows along the north and south walls of the church have been reconstructed.